Dental patients who have already had the benefit of quality dentures know that they will eventually need denture reline services. That is why it can be frustrating when more dental professionals insist that they buy a brand new set of dentures when a simple reline would be more beneficial, as well as being the most cost efficient method. One of the many ways that Grishin Denture Specialist strives to save more denture patients time and money is by assisting them with their denture reline needs. By offering more convenient options in their relining needs, we continue to be the best choice for more patients in Spokane WA. Over time, even the best-made dentures will begin to fit not as snugly as they once did. This occurs as the patients’ gums wear down the surface of the dentures where their natural teeth once were. As a result, patients may eventually experience discomfort or even pain. Luckily, in most cases, the lining of the dentures can be repaired or replaced, preventing them from needing to purchase an entirely new set. Denture relining typically takes one of two forms, soft relining and hard relining. No matter which option is best for your exact needs, we guarantee the best results possible each time. Soft relining involves reshaping the interior lining so that it sits correctly once more. It is an attractive option as it can be completed sooner than hard relining; however, depending on the age of the dentures and how much daily use they are put through, this may not be a permanent solution. 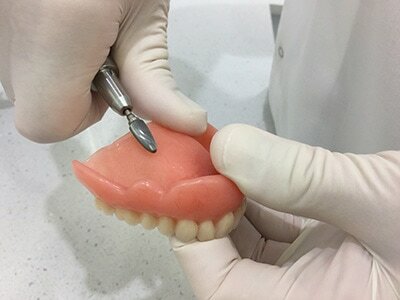 In fact, some soft relined dentures may need to be relined again in as soon as just six weeks depending on the techniques used by the dental professional. Hard denture relining, on the other hand, becomes a much more permanent solution for allowing your dentures to fit the way that they should. This process involves taking a brand new mold of the patient’s mouth which is then cured, giving them the feel and comfort of new dentures without having to replace the entire set. If you need denture relining services but are unsure of which methods or options is right for you, our office is more than happy to consult with you. We can discuss your options and budget and find the perfect solution for your situation. We believe that everyone should have the dentures services that he or she need without having to sacrifice quality over cost.